What a year for UMD! As 2018 NCHC play comes to a close, it is a good time to look back at all the good things that the Bulldogs made happen. One of those almost unbelievable carry-overs from last season is the season series between UMD and this weekend's opponent Western Michigan. 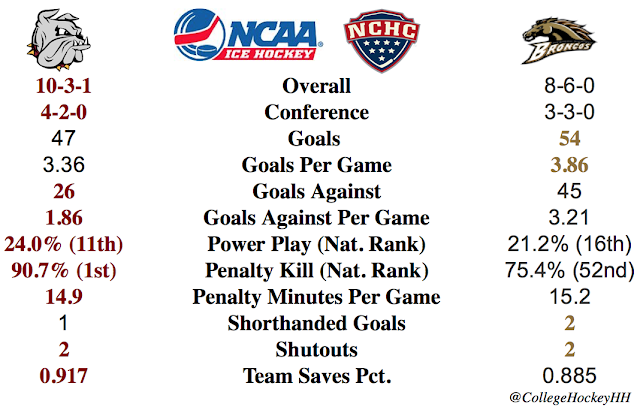 UMD and WMU played six times, four in the regular season and two in the first round of the playoffs. Of the six games, UMD won five. Additionally five of the six games were shutouts. The lone UMD loss was one of the shutouts, 5-0 at Duluth in November. The five UMD wins were 3-0, 8-0, 6-1, 5-0, 2-0. WMU games helped propel goaltender Hunter Shepard to tie the UMD record for most shutouts in a career last season, a record that he broke last weekend. What will this weekend bring? Likely not shutouts either way, but it should be a favorable weekend for UMD.